The core purpose of entrepreneurship, innovation and startup ecosystems is to produce and attract entrepreneurial talent and new ideas in growing volume to become Business Creators, new innovation and developing companies within the ecosystem - catered for by various effective Support Providers events and services - to help these companies develop into great organizations. Success of the ecosystem is measured by the number of great companies growing from the ecosystem. As there are typically multiple development projects running by various actors and consortiums - one of the first and most important ecosystem development responsibility is to have understanding of the ecosystem maturity level and to check if a mutually aligned vision, mission and top level strategy exist at ecosystem level that key actors mutually agree on, where multiple development projects logically link to, and all key actors are aware of the key development projects of each others. ​If something like this does not exist, it should be made as top priority to be created. Build and maintain holistic view and list of all key ecosystem development initiatives and projects. Including new identified needs, ideas, activating initiatives and currently active development projects for up to date key information like; priority, status and progress updates, in logical manner. as well as support provider organizations, people and their offerings available for Business Creators needs, including events, services, funding and other resources. Understand and develop "demand & supply" balance and availability levels at any given time, between these two core ecosystem segments at all business creation development phases and business verticals. Define and measure the KPIs for volume, quality and efficiency of key services, funding and policy instruments, development projects to measure overall business creation outcomes. To identify gaps, bottlenecks, unmet needs, imbalance, inefficiency or obstacles, - and to identify where new ecosystem development initiatives should be created. Organize and coordinate workshops for; regulatory and policy development, designing and developing funding instruments and support functions, seeking or allocating funding and other resources to initiate missing support functions or scale up most effective ones. Only things that can be understood, can be developed. Only things that can be measured, can be improved. Only by sharing things and making them visible, available and known about, can those become commons. Or things will be repeatedly reinvented and duplicated. If there are no “shared things” being worked on, there is no working together and limited resources are dispersed. Only things that are in shared use, can be benchmarked, scaled and developed together. ​Open H2020 call for connecting startup ecosystems and supporting cross-border activities. - Application deadline 28 March 2019. 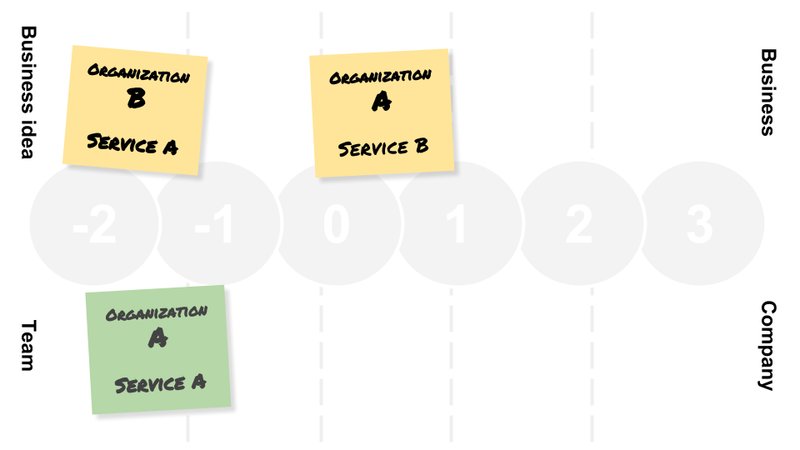 Growth and success of your startup ecosystem is dependent on how well you design, implement and run your ecosystem support service processes. A startup ecosystem is formed by entrepreneurial talent, Business Creators and businesses at various development phases, combined with various types of public, private and NGO Support Provider organizations typically in a city region, interacting as an organic system to create new business and innovative companies. 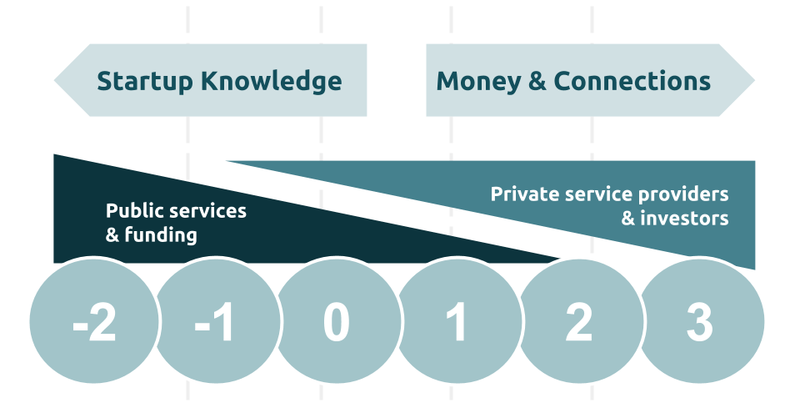 Different Support Providers focus on different parts of the ecosystem, business vertical and/or businesses at their specific development phases. It's extremely helpful to maintain a general sense of the types of key actor segments and organizations, their position in the ecosystem and regards to Business Creation and startup development, along with understanding their main function in the ecosystem context. At the same time the ecosystem is in constant change, where entirely new organizations & services emerge and others are ended. Core purpose of ecosystems is to produce and attract entrepreneurial talent and new ideas in growing volume to build growing businesses. For those new to any ecosystem in any role; talent, business creators, support providers, ecosystem developers or international contacts - simply trying to get some sense and more holistic mental picture about different organizations, available services and services relevancy & availability by reading about websites and directories is extremely challenging and time consuming. Success of the ecosystem is measured by the volume and quality of great companies growing from the ecosystem, so the growth of local ecosystem is dependent from new people entering, navigating and starting to actively take part in it. "Digital economy can not be “departmentalized” to be considered as “something separate”, but something that is embedded part of all functions and operations"
Formation - is about inspiring and attracting new talent and providing access to entrepreneurial education, ideas and knowledge to help build the right mindset, understanding and abilities for the journey ahead, typical issues to avoid or solve, what steps to take in what order and about available support along the way. At Growth - focus becomes mostly about additional resourcing, understanding growth KPI's, creating processes for scaling various business operations, improving financials and help expand business internationally. 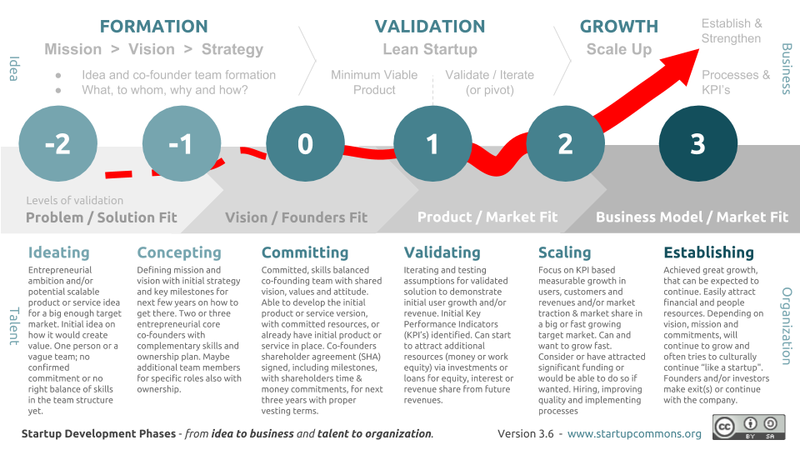 ​Startup Development Phases help understand startup journey, identify key stages and to help develop Startup from "idea to business" and from "founding team to organization". - Learn more about the framework. ​Each ecosystem organization can have one or several services, focusing on specific services or support need by startups in the ecosystem. At top level these services can be mapped to focus on supporting the development of the product side ie. 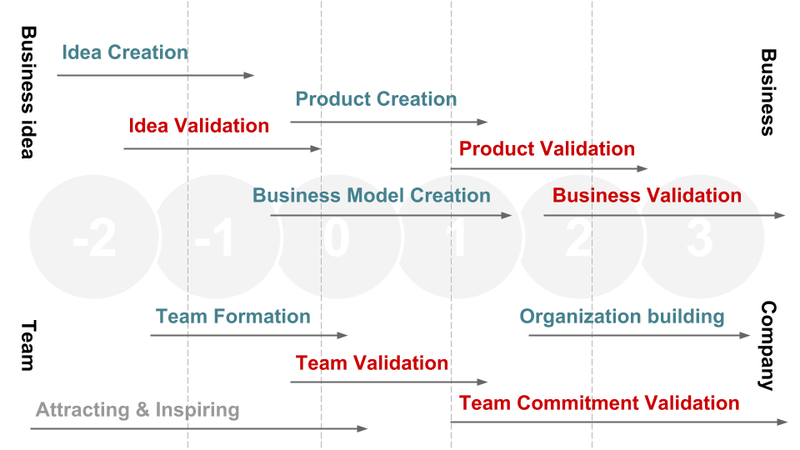 from "idea to business" or to people side, from " founding team to organization", and mapped to specific phase of the overall startup journey. Also individual services are typically available only in specific location and focus only to startups in specific business vertical. On top this, not all services are "always available" - actually only few are. Availability of services vary anything from once per year (like big events) to ongoing services (like one-to-one business advisory) and anything in between. One of the core missions and ongoing main targets for any ecosystem, should be to maintain and cater comprehensive and dynamic information about the available services with good search and filtering functions, as well as to be able to identify caps in available services for ongoing ecosystem development. 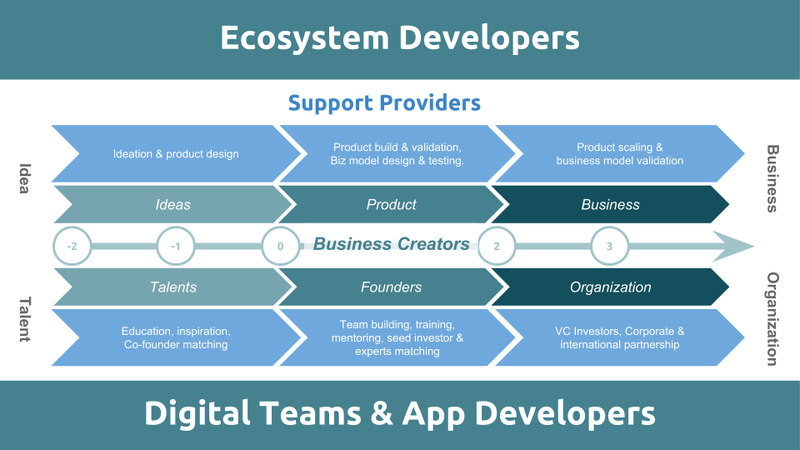 ​Developing startup ecosystems is very multidimensional and involve seemingly independent but connected activities and processes as well as multiple organizations and stakeholders with varying focuses and agendas (obvious and hidden). Also as ecosystem acts as a great concept for communicating complex connections, via “ecosystem thinking” it’s easy to understand that activities like policy, services model or funding instrument aimed for specific area of the ecosystem, it may also have unintentional side effects to some other part of measure of the ecosystem elsewhere. This is one challenge where balanced ecosystem KPI framework as a concept helps to bring to attention, while in addition is helping to bring focus to planning, prioritizing and measuring objectives and actionable items. 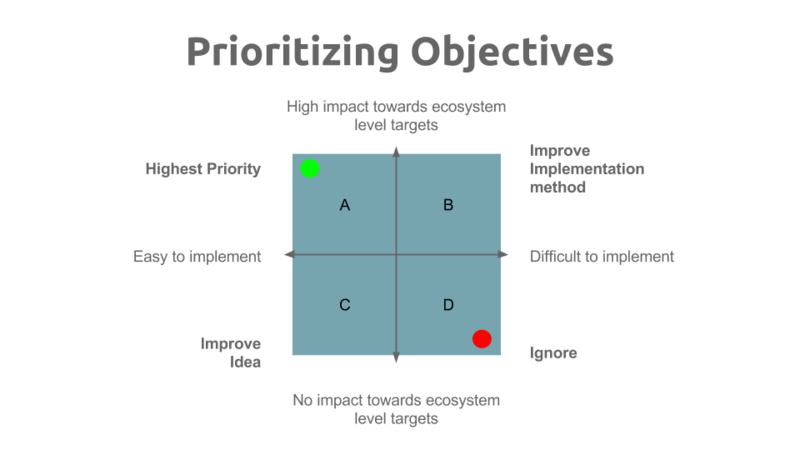 For defining objectives, to prioritizing them and to ultimately measure their impacts and potential side effects, our ecosystem development framework helps in targeting various activities and measuring the impact of these activities, but also to better understand the relations between different areas. Ecosystem Development Framework can be used to help communicate and prioritize development suggestions and help develop national and regional ecosystems is balanced manner. It helps in understanding the connections, relations and impacts of various actions and policies, as well as acts as a framework to communicate on what area a specific action is targeted to improve and to be able to understand the context and measure the impact of specific actions. ​Ecosystem Development Framework is based on Startup Development Phases model. 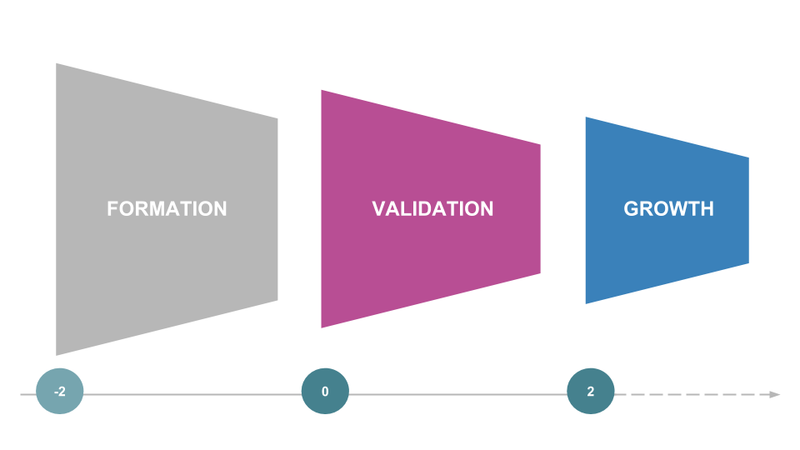 This KPI framework can be used in each of the three key focus areas FORMATION (-2 to 0), VALIDATION (0-2) and GROWTH(2+) separately, but also at the entire ecosystem level as a whole. The framework helps to capture all the key items categories to be improved, as well as the values types to be measured and improved, in such way that the correlations between items and specifically the side effects can be identified from the index results. innovation - problems, research, ideas, concept, products etc. talent- entrepreneurial people, attitude, skills, passion etc. entrepreneurship - mission, vision, culture, values, etc. support - knowledge, services, education, workforce etc. money - funding/revenue; grants, investments, sales etc. growth - growth in “everything”, in volumes, quality and velocity, in companies, in go to market, channels, international networks, jobs, etc. Volume - methods to improve: culture building, communications & marketing, etc. Quality - methods to improve: knowledge, guidance & feedback loops, etc. Velocity - methods to improve: tools & processes, matching etc. 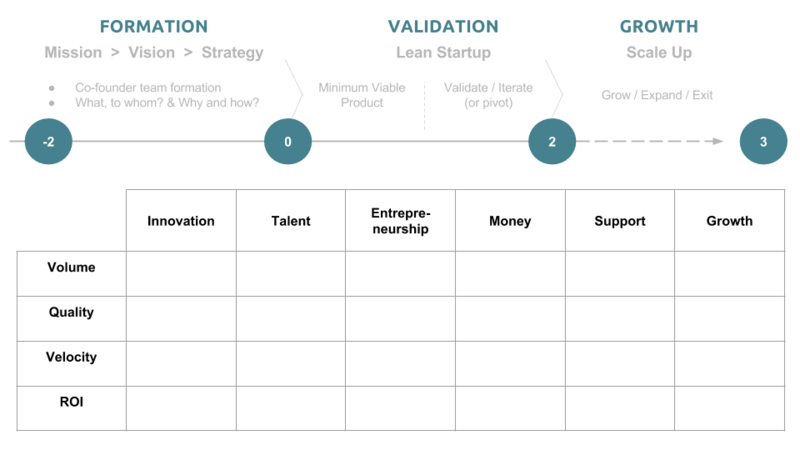 ​By defining more specifically what item and value is being improved with this objective (also can be more specifically in what part of startup development phase is this targeted/impacting), as well as how is that going to be measured, it’s then needed to find the starting level value that can then be used to set target value that is going to be aimed for and/or how are some of the output/deliverables going to look like. After this, becomes defining the how? - to specify a specific initiative, a project, that can be then budgeted, resources and tracked by owner of this initiative, to make sure it actually happens and also to record the progress and ultimate results. It’s also good to try identify potential positive and negative side effects that the initiative may have. We have composed this material to help ecosystem developers like; policy makers and economic development agencies, in their efforts in tackling local ecosystem development challenges. Startup Commons help Ecosystem Developers to design good and fundable ecosystem development projects and can support in deploying, executing and measuring them. Startup ecosystems breed new businesses and innovation, ecosystems are the R&D departments in our cities. Connectivity within and between the ecosystems, is the single most important contributor to growth. 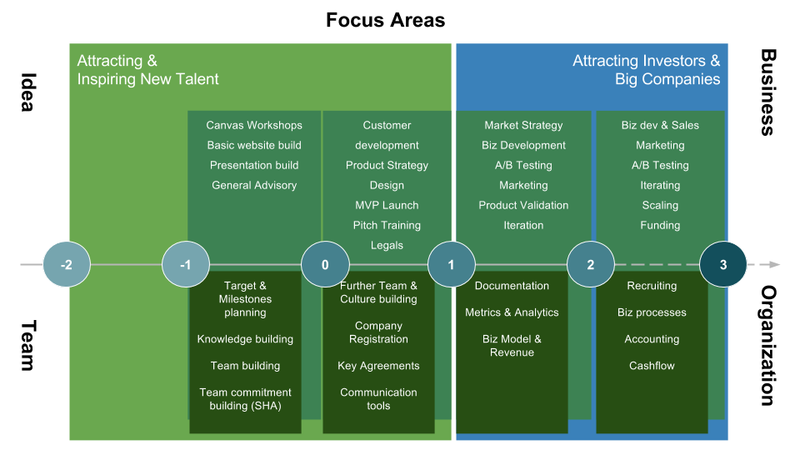 KPI's for measuring the ROI of business creation processes, business creation support functions and development projects - are the key for successful ecosystem level development. "Only things that can be measured can be improved"
​Business Plan Tool for providing high impact support for entire ecosystem in a scalable and cost effective way.